The planters are situated at the entrance to the Memorial Rose Garden. There are three octagonal planters, each carrying 48 plaques. Both the planters and the plaques are made of grey granite. 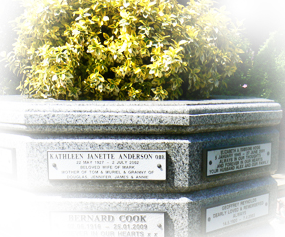 Inscriptions are in relief lettering and should you wish you can have a photo plaque added to the tablet. The lease of the plaque is for 10 years. You may renew this at the end of the period. There is room on the plaque for up to five lines of inscription. It is not possible to leave space for an additional inscription in the future but you may purchase a replacement tablet if required.